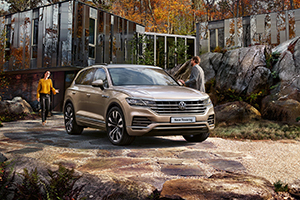 Volkswagen is today proud to open order books for its new flagship SUV – the third generation Touareg – which heads the brand’s youthful product line-up as a paragon of technology, fine design, comfort and driving excellence. Boasting the latest assistance systems, some of them appearing for the first time in a Volkswagen, the Touareg also offers the option of the new Innovision Cockpit which comprises an intuitive digital operating, information, communication and entertainment unit that can be fully personalised. Participating Volkswagen Retailers across the UK will offer the New Touareg with a compelling finance offer from launch. Customers that opt for the Touareg R-Line with a 3.0-litre 286 PS TDI V6 through Volkswagen Financial Services’ Solutions Personal Contract Plan¹ will receive a deposit contribution of £3,000 at 3.3 per cent APR representative. That results in a monthly payment of £499.00. Additionally, customers who purchase a Touareg through a personal contract plan (PCP) will be eligible for two services priced at £299². Debuting with efficient and potent V6 turbocharged engines the Touareg comes with an eight-speed automatic Tiptronic gearbox and 4MOTION all-wheel drive. In the UK, the car will initially be offered with a 286 PS 3.0-litre V6 turbo diesel unit or, from the autumn, a 231 PS version of the same engine. A 340 PS 3.0-litre V6 turbocharged petrol engine will be available to order in the UK in late 2018, with deliveries of that powertrain beginning in 2019. In addition a plug-in hybrid drive with a system power of 367 PS is first planned for introduction in China. The exact launch date of the Touareg with plug-in hybrid drive in Europe has yet to be set. With a torque peak of up to 600 Nm, the 286 PS 3.0 V6 TDI also showcases the new Touareg’s extensive towing capacity. Capable of hauling braked trailer weights of up to 3.5 tonnes, the new car also boasts the latest iteration of Volkswagen’s handy Trailer Assist technology to facilitate simple slow-speed manoeuvring. The 3.0 V6 TDI with 286 PS (2,967 cc) generates its punchy torque peak of 600 Nm from only 2,250 rpm, and offers 42.8 mpg* on the combined cycle. 0-62 mph takes 6.1 seconds, and the Touareg’s top speed is 146 mph. Offered here in three comprehensively specified trims: SEL, R-Line and new R-Line Tech, the five-seat Touareg sits on the Volkswagen Group’s modular longitudinal matrix (MLB). Wider and longer than before, the luxurious new SUV’s dimensions are 4,878 mm long (+77 mm); 2,193 mm wide (including wing mirrors, +44 mm) and 1,702 mm high (-7 mm). Together these create significantly more dynamic proportions and, allied to all-new styling, endow the Touareg with an imposing yet lithe style. The Innovision Cockpit is the control centre of a new era – an interactive interface in which the information and settings of all essential comfort, assist and infotainment systems converge in one simple-to-use matrix. New technology aligns with conventional premium car values of space and cosseting comfort inside the new Touareg, too. The car’s optional electrically adjustable front seats, for instance, offer a new, pneumatic massage function with no fewer than eight programs available. The intensity of the massage functions can be continuously adjusted via individual air cushions. The car’s flexibility is demonstrated by the flexible rear seat system. The position of the rear seats can be shifted by 160 mm fore/aft to create more space in the rear if required. Meanwhile the angle adjustment of the rear seat backrests is also variable in three stages, and by up to 21 degrees. Natural light comes in through the optionally available panoramic sliding roof – the largest yet offered by Volkswagen. The transparent roof section is 1,270 mm long and 825 mm wide (inner dimensions), and the front half can be continuously opened and electrically moved back by almost half a metre (495 mm) and raised. Meanwhile night driving is now more pleasant than ever thanks to a newly developed optional LED ambient light system. Using the ambient light, the atmosphere on board the Touareg can be personalised via 30 different light colours whose brightness can be adjusted. For more details on the new Volkswagen Touareg, including full equipment, economy and emissions details, or to find your local Volkswagen Retailer, please visit www.volkswagen.co.uk.